When I was in junior high school our entire grade did a thing with the 50 states. We were each assigned either a state name or a state capital, and we sat in random places around the auditorium. Then we went through the roster of states, in order of admission, either standing up and giving the number and state name, or the capital. I don't really remember for whom we were doing this nor why, but I do still remember what I was given. Thenceforth I would always remember that Washington was the 42nd state. And it almost worked out that way in real life. 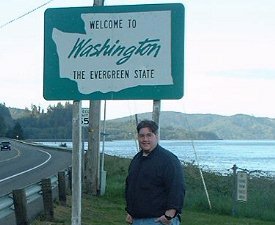 Washington was the 41st state that I have visited. This welcome sign is along the southern border of Washington, just across the three-mile-wide Columbia River from Astoria, Oregon. You may remember seeing the bridge in movies like "Short Circuit." On the Washington side it's signed as simply "Bridge to Oregon." I had the chance to drive around southwestern Washington on my Beaverton trip. On Saturday I drove up to Seattle, and Sunday was a simply spectacular trip up WA-504 towards Mt. St. Helens. Even on the last weekend in April, Johnson Ridge (the closest place you can get to the volcano) was closed because it was still snowed in. But the view from Coldwater Ridge, though about 12 miles from Mt. St. Helens, was no less magnificent. 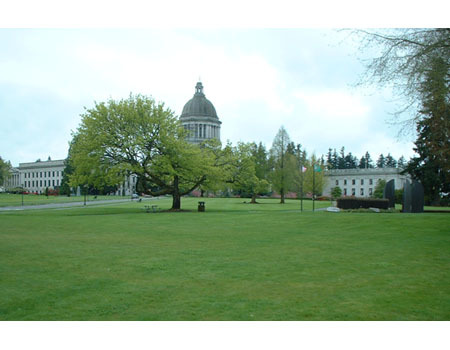 Washington, from what I saw, was pretty much what I had expected: lots of evergreen trees. The sight � and smell! � of the evergreens reminded me of all those vacations in Winter Harbor, Maine. It almost seemed like Maine plus mountains equals Washington. Because I had to go to Oregon on business, I had to miss the first game of my Mets eight-pack, which was against the Brewers; it was the night Shawn Estes took a perfect game into the seventh inning. But I got a consolation prize, of sorts. I had gone on eBay and found a single ticket for a Saturday night game between the Mariners and Yankees in Seattle, and that was the game where Ted Lilly came within five outs of a no-hitter. 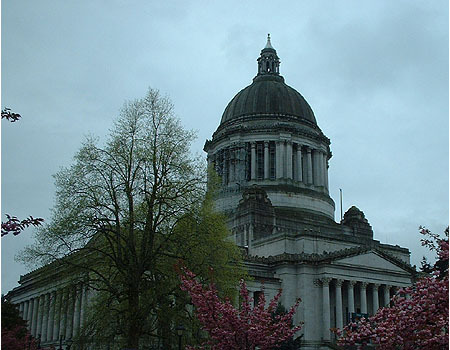 Washington's state capital sits at the southern end of those bodies of water collectively referred to as Puget Sound (though technically it's on the shores of the West Bay of Budd Inlet), half an hour from Tacoma, an hour from Seattle, and to the southwest of the peninsula that shares its name: Olympia. The capitol dome is visible from I-5 both from the north and the south. While I was here it was undergoing some construction. Washington's statehouse and the grounds on which it sits rates quite high on the list of the 32 I have yet visited. My only two complaints are that the capitol lies not in the center of the campus but at one end, and that there isn't a good sightline. This picture is looks towards the capitol at an angle and it is partially obscured by the Insurance Building on the left. The state Supreme Court, named the "Temple of Justice," is directly in front of the statehouse and blocks what would be a great viewpoint. 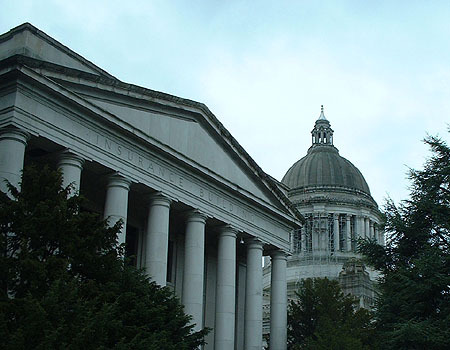 The inscription on the frieze above the main entrance says not "State of Washington" or the state motto or something like that, but simply, "Legislative Building," which I thought was somewhat peculiar. Other than that, the grounds are really nice. While I was there, I saw a family. One boy, about 15 years old, had a piece of paper which I assume was a school assignment. 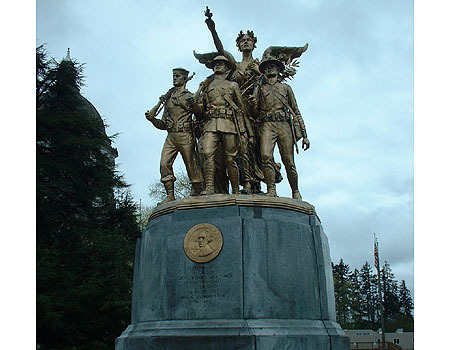 He was going from monument to monument, checking off all of the items on his list that he had to locate on the grounds, all of which celebrated the State of Washington. 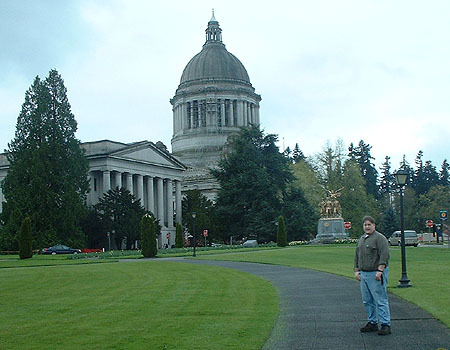 This is pretty close to the image in my mind of what the ideal for a state capitol should be. I remember the student's little brother complaining about walking on the wet grass. "Mom! I'm getting water in my shoes! I'm not kidding!" The World War II Veterans Memorial was particularly striking. 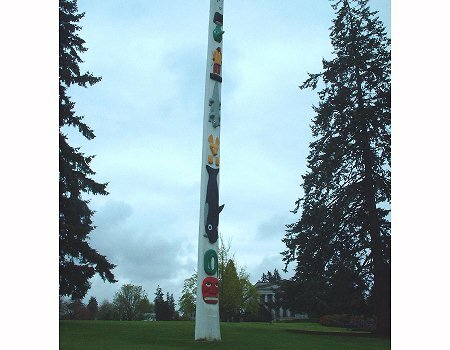 There is a series of metal monoliths, about ten feet high with one of the top corners rounded off. There is a picture in the "More JimPoz Photos" link below. It's a little difficult to see, but try to make out a silhouette of two soldiers. 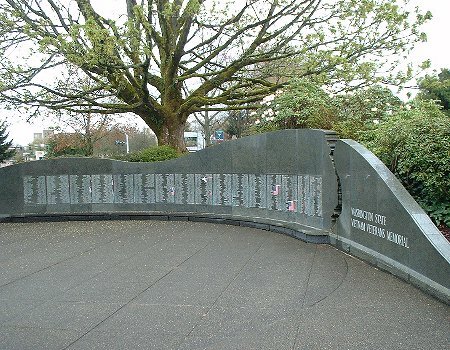 There is one of these on each side of each of the monoliths, and the silhouettes are actually made of the engraved names of all of the sons and daughters of Washington State lost in the Second World War. You might remember that back in Frankfort, Kentucky, I was talking to a state trooper by the floral clock. 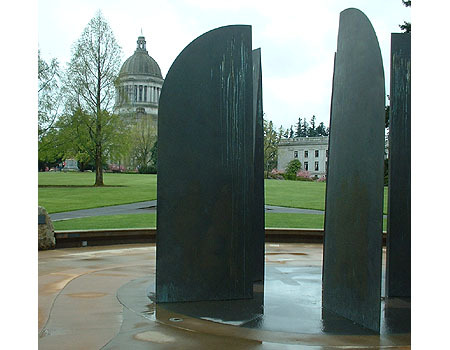 After mentioning the Project to him, he had asked me if I had ever been to Olympia, and when I finally made it here just shy of two years later I realized why. 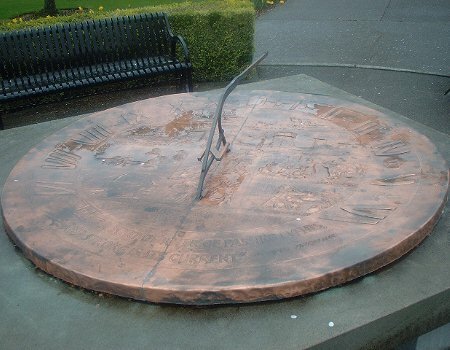 On the south front, between the capitol and the state library, is a large sundial. 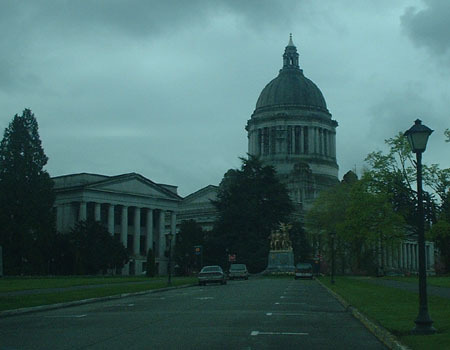 I wasn't able to use it as my visit to Olympia took place under overcast skies. This page loaded in 2.148 milliseconds.